In spite of all the turbulence in our lives, or perhaps because of it, traditional fairs and festivals remain especially popular. Other ventures that compete for your "leisure" time have struggled in recent years, but somehow the old standbys stand as strong as ever. They adapt, but remain essentially the same summer after summer, offering things your parents didn't want you to miss, and things you won't let your kids miss. In these cases, it is fortunate that the more things change, the more things stay the same. Warren County Farmers' Fair celebrates it's eightieth year in 2017. The event is one of the remaining agricultural fairs in New Jersey, but has added a few interesting twists. In 2001, the fair directors realized that, since several balloon pilots lived close by, it would be relatively simple to include the spectacle of hot air balloons launching from the fairgrounds. The balloon festival has since become an integral part of the Farmer's Fair, and will include at least thirty-five balloons this summer. Other additions to the fair over the years have been the popular power events. Just about every night in the Main Arena you can find a vehicle of some sort revving up and getting muddy, crunched or maxed out. The Warren County Farmers' Fair and Hot Air Balloon Festival also remains economical, which is ultra important for families these days. Some freebies for fairgoers include Lawnmower Races in the Main Arena on Sunday afternoon and a Kids' Corra—where small children will be entertained for hours, for free. In addition, parking remains free and children twelve and younger on weekdays, before 4pm, are admitted free. Other additions through the years have been the Traditional Arts Expo, in it's thirteenth year, and Ryan Pelton, Elvis Impersonator, who will return for the third year. The fair runs for an entire week, starting each year on the Sunday prior to, or of, August 1. The 2017 fair takes place July 29 - August 5. The balloon shows have also steadily stretched from four days to the entire week. Co-organizer Giulia Iannitelli says, "In 2008 when fifteen pilots just showed up to fly on Monday and Tuesday of the fair, we knew we could make it a week-long festival without burning them out. After discussing with sponsor AmeriGas to see if they would supply propane for the additional nights, we made it official. More tethered rides will also be available this year from 4 to 8 pm, weather permitting. And, we have a monstrous surprise for the little ones—a special shape, giant green balloon that looks like a monster! There will also be a Walk-A-Bout balloon at 4 pm each day." Bicycle Balloon races, only at the Warren County Farmers’ Fair!. 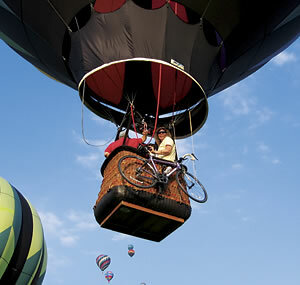 In the Bicycle Balloon Race, pilots donate balloon rides to bikers, who strap their bicycles to the outside of the basket. Each team takes off with map in hand of the boundary line they must cross over before the pilot can set down and let the biker out. The biker then races back to the fairgrounds. The team that launches and then returns to the fairgrounds in the shortest amount of time wins. Biker registration fees are donated in their entirety to the ADM Foundation. 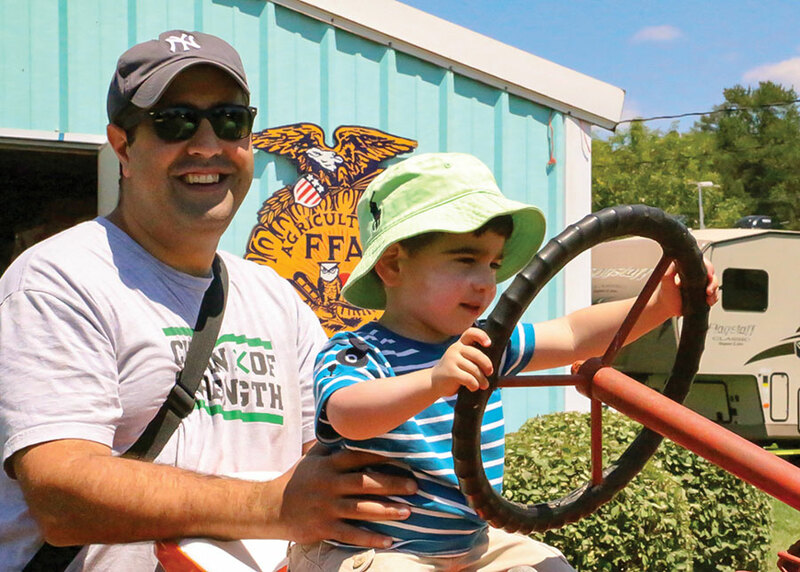 If you have not visited the Warren County Farmers' Fair in a few years you're invited back! This agricultural fair has grown considerably to include something for everyone. After all, growing things is what farmers do best. The 2017 fair takes place July 29 - August 5 at the Warren County Farmers' Fairgrounds in Harmony, NJ. For information, please call 908/859-6563 or visit their website. The ten-day extravaganza now known as the New Jersey State Fair had it's origins back in 1821, and the annual Sussex County Horse Show took place in ever-expanding form in Branchville from 1936 to 1976, when the fair moved to new grounds on a 150-acre dairy farm on Plains Road in Augusta. In 2003, the Farm and Horse Show expanded its name to include the "State Fair" designation. The trade name, formerly owned by Reithoffer Shows, Inc., was essentially exchanged for the right to the carnival concessions at the Fair. Howard Worts, who was fair manager at the time (now retired), considers the name change entirely positive. "Number one, it didn't cost the fair a plug nickel. And very simply, what is in a name? Without being detrimental to the 'Farm and Horse Show' name, in outer areas, 'State Fair' has much broader connotations. It appeals to more people. We don't really need the name locally, people just want to know what this year's dates are." The re-branding strategy has paid off, encouraging thousands of visitors not yet familiar with the fair to attend. 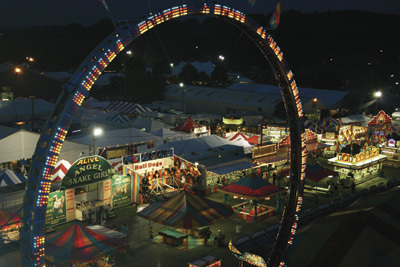 In 2006, with ten days of good weather, the Fair had its best year ever, drawing well over 200,000 attendees. New Jersey's fair is unlike most other state fairs. "The difference is that we own the name. We're not a state entity, not funded or run by the state. We have the best of both worlds. We can run the fair as we please. Nobody is looking over our shoulder except our own Board of Directors," says Worts. "The scope of the fair remains the same; we will always remain an agricultural fair." Many believe that the fair had earned the honorable distinction long before the turn of this century. A real country fair, the home pride of generations worked closely with the land is everywhere to be seen: in the good food, good works, and good times that are the true bounty and community of rural, agricultural heritage. Animals are everywhere you look - from a bee and honey display to the barns at the livestock exhibitions, in the horticultural exhibits and contests, and in the Horse Show Ring. The Show is the largest livestock event and AHSA sanctioned festivity in New Jersey, with horses of all kinds; from workhorses to the sleekest thoroughbreds. In addition to the Horse Show all week you can see racing pigs, racing turtles, a llama show, woodchopping competition, chainsaw sculpture, a performing arts tent, fiddler's contest, a queen pageant, and arts and crafts from all over the East Coast! And in the Outdoor Entertainment Arena: Cyclocross bike racing, demolition derby, oxen, truck and tractor pulls, a tri-state battle of the bands, and a country music showcase. You'll taste food whose recipes hail from the heart of rural New Jersey or from just about anywhere in the world. All of the various waves of immigrations that have built the state of New Jersey bring good things to these tables! And Reithoffer's Carnival is spectacular, as always. New Jersey State Fair takes place August 4-13, 2017 at the Sussex County Fairgrounds in Augusta, NJ. 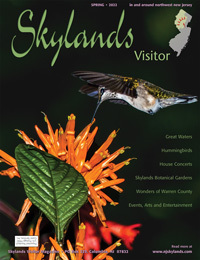 For information, please call 973/948-5500 or visit their website.